Your business will finally have a professional presence on Facebook! Your Facebook presence is boosted by Facebook advertising. Your business is conveniently communicating and advertising on the same platform. You know that your business must have a presence on Facebook and you are aware of the power of social networks, but you simply neither have the time nor have the desire to devote yourself to Facebook? 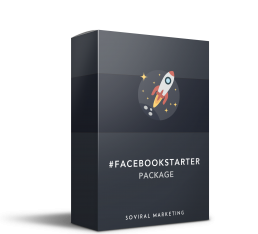 The Facebook Starter Pack will give your company a solid presence on Facebook with the creation of a complete business page, using all of the functionalities that the network offers for businesses. Upon defining your business’s main marketing objective (awareness, consideration or conversion), a Facebook ad campaign will also come to reinforce your page’s impact. 2 hours of personalized consulting to further help you with your digital strategy.